I admit that I was initially apprehensive when it came to having the cover designed. I had a rough idea of what I wanted but wasn't sure it could be properly translated. Tim from Dissect Designs blew me away with his ideas, designs, and customer service. I absolutely love what he has created and can't wait to collaborate with him again! It has been over two months now since I've received my manuscript back from the editor, but I have learned so much about the publishing process in that time. I've reviewed the edits, implemented recommended changes, chose a series name, had the cover designed, formed a publishing company, chose distribution methods, set prices, etc. My latest challenge - and not a fun one - was creating an epub file for the ebook. Good news is that a publishing date of May 1, 2018 has been established! The ebook is currently available for preorder right now on Amazon. Proofs of the hardcover and paperbacks are on their way to me now for approval, after which they will be, too! 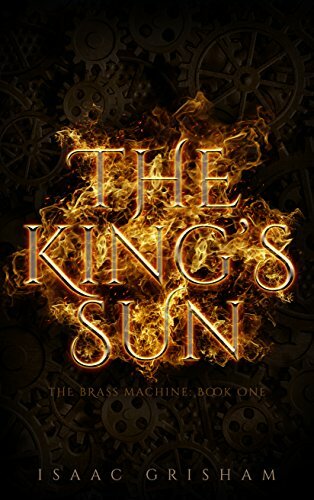 It's been 21 months since I finished the first draft of The King's Sun. Sure, I took a few weeks off to celebrate its completion, but I have still been working hard at it since. I've gone through the manuscript several times and used beta readers for feedback, each time making the appropriate changes. I am now very excited to be working with professional editor Kristen of Kristen Corrects! Work gets underway in January. The first chapters of the follow-up book are completed, too. I am really looking forward to where these characters' journeys take them! On the evening of June 12th, just after watching that night’s episode of Game of Thrones, my partner and I commented on how lucky we were that the air conditioner was working perfectly. Looking at the unit when we bought the house a few months earlier, we thought for sure that it wouldn’t even turn on. Though we initially feared we had cursed ourselves, a thorough search of both the interior and exterior of the house proved that the source of the unpleasant odor was Cooper Blue, our faithful Sheltie. A quick Google search of “Why does my dog smell like burnt rubber” revealed that we had been the victim of a skunk. Cooper must have been quick enough to avoid a direct spray that night (and the following night and the following Monday night), but a lot of time was spent giving him late night baths. The incidents were stressful, I lost a lot of sleep, and I began to treat the yard like a military zone. Skunks avoid lights, so I’ve added landscape lights and kept the deck light on overnight. Naturally, they avoid their natural predators, so I placed blinking red LED lights around the fence (they are supposed to resemble the eyes of hungry hunters). I have sprinkled both animal repellant pellets and fox urine all around the perimeter. Additional chicken wire fencing has been added alongside the fence where a small critter could possibly get in underneath. All this, and I still saw one squeezing through the front fence last night as I pulled up to the house. I began to wonder why the odorous animal was causing me such anxiety. They are not a new plague upon this planet, and people and canines deal with them on a regular basis. Yet, on June 12, I became obsessed with protecting our home against them. It dawned on me that it may have been my own reaction to the tragic event in Orlando that occurred earlier that day. Though I was 1,200 miles away from that nightclub, my sense of security was shaken. I felt vulnerable, and I was concerned over the safety of myself, my partner, and my friends. Seeing the responses from particular politicians and, even more disconcerting, everyday US citizens did not quell my fears in the least. I have my opinions on gun rights/control, religion, government policies and responsibilities, mental health issues, immigration, and all the other discussions that have cropped up (again) since June 12th. However, I keep thinking that the evil behind the event (and others like yesterday’s bombing in Istanbul) are the things of stories. I should only have to worry about the nightmares I’ll get from reading about Hannibal Lecter, Kevin (We Need to Talk About Kevin), Randall Flagg (The Stand), or Sauron, much less a hungry pack of dinosaurs – these characters exist to entertain and serve as warnings. I should not have to actually worry about being eaten, murdered, or subjugated. No one should. Florida should be afraid of alligators, which are just hungry and not evil, not going out for a night on the town. The skunk (or skunks) are still around. I’ll continue to fight them, but I have ceased misplacing any feelings or anxiety on them. I found comfort and safety in my partner, family, and friends. I ran a 5k at the Proud to Run race in Chicago last weekend, supporting both the LGBT community and runners. I reminded myself that as much as the world is cruel and uncaring, it is also wondrous and loving. I was one of those school students who actually enjoyed reading assignments. Not the social studies or history books (though they were enjoyable in their own right) but actual literature. I remember crying at the end of Where the Red Fern Grows, a book that touched my canine-loving heart so much I read it twice. My parents were startled on both rounds when they found me in tears. Another piece that has stayed with me over the years is Rain, Rain, Go Away, a short story by Isaac Asimov. More fantasy than science fiction, it tells of the Sakkaros family, new neighbors of the Wrights. The Sakkaros avoid any and all contact with water, only leaving their home under the best weather conditions and carrying a radio and barometer. What happens in the end gives meaning to their family name! If you've never read it, you can easily find it online. It's a quick read. Closing on a new home tomorrow! I can't wait to set up the office and finish up the current round of work on The King's Sun!